Secrets of The Lost Symbol features the thought-provoking insights of scholars, authors, journalists, and leading thinkers on the major themes in Dan Brown's latest blockbuster. The Lost Symbol may be a beach read, but underneath the sand, it is a novel of big ideas. That's why we've created Secrets of the Lost Symbol: a book that explores those ideas in fascinating and compelling ways. Squibnocket Partners is proud to announce the imminent release of Secrets of The Lost Symbol, the only comprehensive guide to Dan Brown’s latest blockbuster novel. 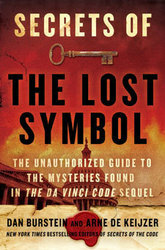 Dan Burstein and Arne de Keijzer, editors of the New York Times and international best-selling reader’s guides to Dan Brown’s previous novels, The Da Vinci Code and Angels & Demons, have once again invited world-class thinkers to interpret the rich and important ideas woven into The Lost Symbol. The book will be in stores on December 22, but in a ground-breaking move by the publisher, William Morrow/HarperCollins, Secrets of The Lost Symbol was released first as an e-book on December 1. Secrets of The Lost Symbol features the expertise and often provocative insights of scholars, authors, journalists and leading thinkers from multiple fields who cover subjects ranging from Freemasons to the Founding Fathers, from the “ancient mysteries” to “noetic science”, and from Enlightenment Europe to the cryptic art, Masonic architecture, and symbols of Washington, D.C. Along the way, readers will delve into centuries-old controversies about Freemasons, decrypt the “true” Dan Brown, decode symbols and metaphors placed throughout the novel, get first-hand glimpses into the world of the thought experiments featured in the novel, and discover amazing “hidden” facts about the Capitol, the Smithsonian, the science v. religion debate, the Founding Fathers, the occult history of America, and much more. Steven Johnson, author and polymath, on why Dan Brown focused on the Founding Fathers: "The key thing to understand about the Founding Fathers is that they were constantly trying to create links between different fields: they saw religion and science and political theory as a unified web, not a series of disciplines with impenetrable walls between them…." Mitch Horowitz, author of Occult America, on how our history is suffused with the mystery traditions: "The religious innovators of the 19th century experimented with a wide array of occult and esoteric ideas, and they believed that the mind was causative and could shape outer events. Some went so far as to suggest that the subconscious was the same as the creative power called God…." Rabbi Irwin Kula, whose insightful commentary delves into the ways in which The Lost Symbol connects to the major debates in religion and spirituality today: "We are seeing now that we are incomplete, that in the postmodern era we’re beginning to know that we have to recover some lost wisdom from previous eras…"
Lynne McTaggart, the “noetic scientist” mentioned admiringly in Dan Brown’s novel, on the controversial notion that there is a link between modern science and ancient mysticism: "Science is now proving what the ancients have espoused. Belief in the power of thought is nothing new; what’s new is the scientific explanation for it.…"
Deirdre Good, the widely respected scholar of religion who teaches at the General Seminary in New York: "In TLS Dan Brown champions a religion that puts “me” first, when “true” religion calls us to collective action instead of simply a process of individual self-realization." Other prominent contributors to Secrets of The Lost Symbol include: Amir D. Aczel, William Arntz, Lou Aronica, Marcelo Gleiser, Ron Hogan, Mark E. Koltko-Rivera, Thomas Levenson, Michael Parkes, Ingrid Rowland, Marilyn Mandala Schlitz, David A. Shugarts, and James Wasserman. Secrets of The Lost Symbol is for every reader who has wondered “what is fact and what is fiction” in the Dan Brown novel. It is for every reader who wants a thorough, thoughtful and thought-provoking book examining one of the most influential novels of our times. The dialogue continues today on the Secrets of The Lost Symbol blog and Twitter feed. Dan Burstein, co-creator of the Secrets series, is an award-winning journalist and the author of 12 prior books on subjects ranging from global economics to advanced technology and popular culture. He is also founder and managing partner of Millennium Technology Ventures, a New York–based venture capital firm that invests in innovative technology companies. Arne de Keijzer is a former China business consultant. He has written or contributed to books ranging from China’s impact on the global economy to today’s new technologies. Created in 2004, Burstein and de Keijzer's Secrets series includes the New York Times bestselling Secrets of the Code, Secrets of Angels & Demons, Secrets of the Widow's Son, and Secrets of Mary Magdalene. Altogether, there are now over four million Secrets books in print worldwide.